2. Locate 'Donations' under the Financial heading. 3. 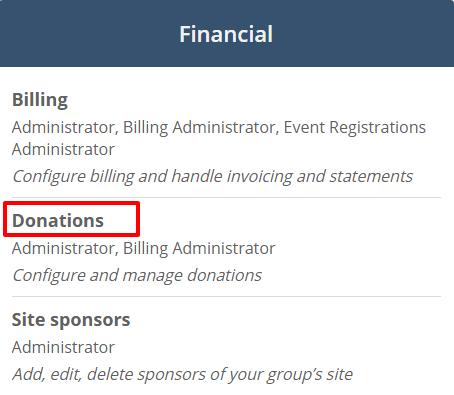 Click the red Administration icon to configure the donations. 5. If you would like to edit the current amount, click the Edit icon to the right of the amount that you want to substitute. 6. A new window will appear. Click the arrow icon to select from the available billing codes. Click the plus sign to create a new billing code. Click the pencil icon to edit the current billing code. 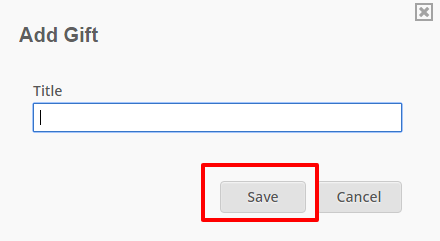 Once the changes have been added click the 'Save' button. 7. If you want to delete the donation amount, please click the trash icon. 8. You can also check off the Gift mode, so donations will be appointed to a specific project that your club runs. Check off the 'Allow Gift To Be a Tribute' option to allow donating money in honor or in memory of someone. 9. Click the red Administration icon and select 'Add Gift' to create a gift project. 10. Type in the title for the Gift project and click 'Save'.